Our newest baking book Vegan Pie In The Sky will be out next month, just in time for pie season! You can preorder on Amazon now. We’re so very excited to give you a few previews and get you ready to tie on that apron, turn up your oven and sink your teeth into some luscious pie. Here’s a pic of the entire bookflap: front, back and inside. And here’s the cover. Yes, we put a bird on it! OK, now on to the recipe! It’s the perfect addition to your autumn table. Delicate and ever so fancy, there’s so much to love about this classic tart stuffed with a fragrant baked almond custard filling and tender pears. The top is brushed with a bit of melted apricot jam for even more flavor and shimmer. To melt the jam, gently heat in a small pot for about 5 minutes, stirring often. Or melt in a microwave for a minute or two (depending on the strength of your machine), stirring every 30 seconds. It should be liquid enough to brush on top of the pie. Pears will brown very rapidly once peeled. Rubbing peeled pears with a little lemon juice will halt the process and allow you to slice and layer them at your own pace. Preheat oven to 350 F. In a food processor pulse together margarine, sugar, ground almonds, cornstarch, ground cinnamon, and salt until crumbly. Continue to pulse and stream in almond milk, vanilla extract, and almond extract to form a thick batter. Spread frangipane mixture into tart shell. Peel the pears, remove the core and slice in half. Slice each half into 1/4 inch thin slices and lay overlapping slices on top of the frangipane, gently pressing the pears half way into the batter. Bake the tart for 35 to 40 minutes until the top is golden brown, then move the tart onto a cooling rack and cool for 20 minutes, then brush top of pears with melted jam. Cool tart for at least another hour before slicing with a thin, sharp knife dipped in cold water. Looks gorgeous! If only I wasn’t stuck in a kitchenless college dorm I would make this in a second! Can’t wait to get the cookbook! Will there be a Kindle version? I’ve always wondered what a frangipane tart was. That looks like it’d be a huge hit with my family (and me!). My parents regularly leave 50# of pears on my door step in the fall, this is FANTASTIC! Awesome I’m so excited for a vegan baking cookbook from reliable recipe writers like yo! The hubby would LOVE this! Can’t wait for the cookbook! When? October 17th? Is that right???? Can’t wait!! Which nuts or nut-like things are you able to eat? Yum! I neeeeed to try this. Can’t wait for the new book to come out! 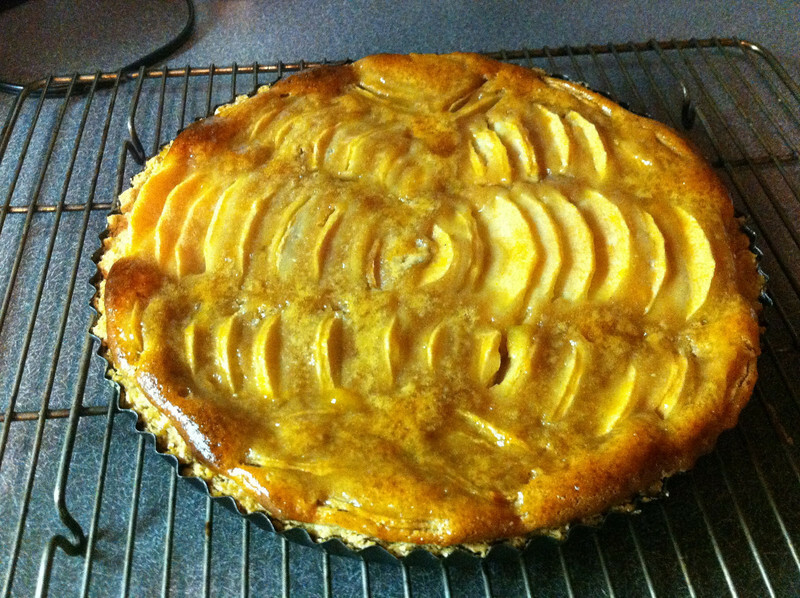 And this pear tart looks amazing. I’m definitely going to try it. Our pear tree is dropping pears faster than we know what to do with them. Thanks for the inspiration. I just bought Veganomicon and the Vegan Cookie book. Now I want this and thecupcake book and I’ll be in heaven! Thanks! Well for texture I would use sunflower seeds. Perhaps a little coconut extract for some extra flavor? Of course, it won’t taste like almonds, but I bet it will be yummy. And thank YOU for saying thank you! Makes my day. Hope you find your pears! Will you give a gluten free option like in the cookie book? October 25th can’t come soon enough! We did give a gluten free option in this recipe, but not every recipe has one. Fortunately most of the fillings are indeed gluten free, so if you use a GF crust you’re good to go. Whoa, that looks completely wonderful! Dying for the cookbook, I’ve got all the other ones! I’m currently ploughing my way through pretty much every recipe from Appetite for Reduction, so obviously I’ll need to balance out all that healthy eating with a big ol slice of pie! Oh I hope I’ll be able to get this book in Holland soon! 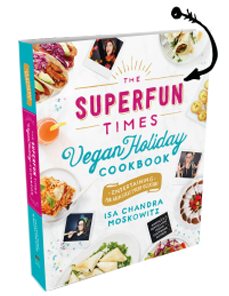 Apart from buying one for myself, I’m thinking of giving it as a birthday gift to some of my non-vegan friends, so they can experience some vegan love and joy too (okay I confess, my motives would not be entirely altruistic…) Thank you for writing such wonderful cookbooks! Holy delicious. Can’t wait for the book! Made this with some white peaches I had, and the almond crust. Absolutely delicious!! I would make this tart with sweet cherries in cherry season too. And put a bird on it. We put birds on things! Made this a couple of nights ago. My husband said it was THE best dessert I’d ever made…and I’ve made a lot…even pre-vegan. Almondy, peary and almost buttery utterly delicious. I’ll be making this again. I just made this for a dinner party- incredible & got rave reviews. Thanks! had a great cooking experience with this tart. non-vegans were unaware of its special features until told. thank you. Good to know that it still worked with the subs! This was sooooo good. This is so going into my book of yum recipes*! AND I will make this for my carnivore collegues and they will adore it, I’m sure! Oh my fricking stars, this was amazing!!!! I am ridiculously excited about this. My favorite “discovered on the internet” dessert is Bakewell Tart, which is tart cherry jam covered with frangipane. The recipe I have is done by weight, so it’s a huge PITA to make (I have no concept of weight/volume comparisons so I haven’t been able to convert it to cups, Tbs, etc.) and takes me forever. Your version looks quicker and easier. I can’t wait to try it!!! Made this recipe with King Arthur’s Gluten Free flour mix! It was YUMMY! I mixed apples and pears b/c I made it for Rosh Hashana. Everyone…vegans, celiacs, egg allergy kids, and even those carnivores…loved it! I’ve already made it twice…pure heaven!! Can not wait for Vegan Pie in the Sky!! Thank you from the bottom of my vegan heart!! Okay, mine never became a “thick batter”, what am I doing wrong? When I poured it in the crust, it was pretty soupy and mealy. I baked it anyway, having to leave it in for MUCH longer than suggested. I brushed the apricot on and in the middle the batter was not finished. It’s currently cooling in the garage and while my family is great and will try anything, I’m incredibly bummed but kind of at a loss. I will say I used my parent’s Emmie food processor which I believe is almost as old as I am. Any thoughts? This looks so good in the picture (and it DID makes my house smell great!)! I just baked this. The batter tasted amazing, but just like the last post, mine did not set up. I am wondering what I did wrong. I realized in the middle of the recipe that my almonds did have the skin on them. Would that prevent it from setting up? Please help Isa! Thanks! My batter was pretty thin too (but also tastes amazing). Mine is currently baking so I’m looking forward to seeing how it turns out. I think next time I won’t add as much almond milk. Count me in as another person with batter that was too thin. It didn’t set up after 20 extra minutes in the oven (though it was still thicker than the recommended time). I’m putting it in the fridge to see if that will help it firm up. I ground the blanched almonds in a brand new food processor, but I’m still learning my way around it. Maybe I didn’t ground them finely enough? Would purchased almond meal or flour provide the desired result? Sorry some people had problems! We didn’t have any failures in testing so I’m not sure what the problem could be. I’m curious what the texture was after cooling. Are people using a different starch other than cornstarch or following the recipe to a tee? I’d love to get to the bottom of this! Would almond meal work instead of the ground almonds? We use a few different pans for the different kinds of pies. But most of the straight-up pies are using a deepdish 9 inch glass or ceramic pie plate: http://www.amazon.com/gp/product/B0026RHI78/ref=as_li_ss_tl?ie=UTF8&tag=wwwtheppkcom-20&linkCode=as2&camp=217145&creative=399369&creativeASIN=B0026RHI78. We also use a shallow metal 9 inch pan for items with a cookie crust, like the chocolate pudding pie: http://www.amazon.com/gp/product/B001BCNTTU/ref=as_li_ss_tl?ie=UTF8&tag=wwwtheppkcom-20&linkCode=as2&camp=217145&creative=399369&creativeASIN=B001BCNTTU. And we use a 9 inch Springform cake pan for cheesecakes: http://rcm.amazon.com/e/cm?lt1=_blank&bc1=000000&IS2=1&bg1=FFFFFF&fc1=000000&lc1=0000FF&t=wwwtheppkcom-20&o=1&p=8&l=as4&m=amazon&f=ifr&ref=ss_til&asins=B000237FSA. To get the pie out of the oven, use two oven mitts, pull the oven rack out and gently lift from the bottom! I made this for a recent potluck and everyone loved it. They couldn’t believe it was vegan! Next time I would leave off the apricot jam . It was a little too sweet for my taste, but no one else commented on it. I am waiting for my book to arrive from Amazon. Thank you for all of you great recipes. Your pumpkin waffles rock!!! You know what? In the actual book we did decide to nix the jam. I just put up an older version of the recipe accidentally. Glad you loved it! Noo! Oh well, mine has the glaze and I will see what happens. Actually, I had to add extra oat flour to the crust and did not add any liquid as it was very runny. I think I didn’t grind the almonds fine enough. The filling was initially grainy, but I blended it in the vitamix after I initially mixed it by hand and it smoothed out and became thicker. I ‘ ground’ the almonds In a coffee grinder before I mixed them in. It wasn’t brown enough at 40 minutes, and still gooey in the middle and I put it back in for another 5 minutes, still not ready, then ‘forgot’ it for another 10 minutes or so….thank god I had turned the oven off. All in all it looks great and I can’t wait to tast it! The tart was a hit all around. The crust was crumbly delicious (though I really noticed the oil) – my coworkers, including one chef, really raved. The texture of the filling was creamy, custardy and not overdone and the apricot glaze was perfect and not too sweet. Loved this, Isa. Made it for a work potluck, and it was so tasty and it just looks gorgeous. I used the recipe in the book which doesn’t mention the jam. I made a simple rum sauce… I almost made an amaretto sauce, but I wanted more contrast. It was divine. Dur, just read above comment re: jam. good call. This looks fantastic! If I already have almond meal, what measurements should I use? I’m assuming the blanched almonds reduce to a different volume when ground up… thanks! This is the second time I’ve made this tart — and I fixed the errors I thought I made in the first one and the batter seemed a bit thicker but It’s going on one hour in the oven and it’s still doesn’t look “done.” I used just regular sliced almonds and ground them up, is that my problem? Please help! This tastes DIVINE either way but I really want it to set up nicely to serve for Thanksgiving tomorrow. I had the same issue as Lauren – the batter wasn’t anywhere near “spreadable”. It was completely liquid! There ensued a very nervous hour of baking, covering with foil, adjusting the oven temperature, etc, trying to get it to actually bake all the way through. I finally got it done, but despite my best efforts it meant that the crust came out kind of singed in places. I followed the recipe to the letter so I don’t know what went wrong! 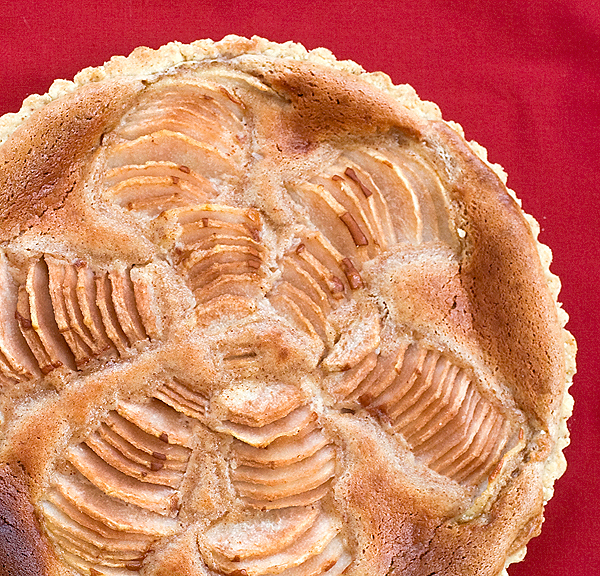 I made this for Thanksgiving, using very thinly sliced sweet apples. It was fabulous. I can’t believe how pretty it looked. @ESW, the batter tasted oily at first but the cooked product was not oily at all. Yes, I agree with above bloggers, that the filling needs to be processed a long time to make it smooth, but honestly I think the slightly chunky texture reminds me more of my Italian grandma’s almond pies. I did prep it ahead, kept the prebaked crust and filling separate in the fridge overnight. I brought it all to almost room temp before putting it together and it was perfect. I was worried about the measurements using only almond slivers (crust recipe calls for slivers, filling recipe for almond slices), but it turned out not to be an issue. Agree with leaving off the jam glaze. I tried it, it didn’t really look any better that way and was more effort for zero return. Isa, you rock and I will make this many times. Thank you for helping me keep my reputation as a good cook, in spite of having gone vegan!!! Actually, now that I think about it I do wonder if the “failures” to set are because of not grinding the almonds finely enough. The instruction of “pulsed” in food processor is NOT what I did. I ground the heck out of it in my food processor to make a fine almond meal, and still initially felt that it was a bit grainy (but liked the final result a lot). Thank you so much for posting such a wide range of creative recipes. Mine and my Mann’s bellies are quite full of love. I made this for company, none of whom are vegans (but I’ll be damned if I’m going to bake something that I can’t eat). Everyone thought it was delicious, even my husband who is a tart snob (he makes delicious, butter-laden fruit tarts all the time). I used Bob’s Red Mill almond meal for the almond crust and the filling which worked great, although I had to estimate how much to use. This one’s a winner, and if it’s any indication of the Pie in the Sky cookbook, I’ll be putting that one on my wish list for the holidays. Made it for Christmas dinner. I’m buying the book ASAP to complete my Terry and Isa dessert trilogy. It’s in the oven as I type….we had the lentil tacos for dinner….very happy indeed. This sounds amazing. Is there any way to substitute the margarine for oil at all? Wonderful wonderful wonderful! I had no problem with my frangipani thickening, though I added a little extra cornstarch to be safe after reading some of the other comments here. The only thing I’ll do different next time is omit the almonds from the frangipani and just use almond extract. I would like to have a smoother “creamier” textured frangipani, and my food processor could not get the almonds fine enough to achieve that. Also, i substituted coconut oil for canola oil in the almond press-in crust. Great recipe, thanks so much. I just picked up your Vegan Pie in the sky today…god it looks good. I’d made this pie from your web page plus the rad whip and the key lime pie and they were utterly fantastic. Can’t wait to try the little lemon mousse pies and the banoffee pie! Mmmmmmm I love the Rad whip but mine didn’t whip up as much as it was supposed to. It was still fantastic. Might be because I can’t get agar agar powder and have been using the flakes. I just totally made a sugar free version of this delicious pie using liquid stevia instead of sugar. The whole family loved it, omnis and all. It did not caramelize as much as when you use sugar, but otherwise, it was yum. Okay I made the Boston Cream pie from your book and it was so damned good that I made the lemon mouse pie on the same day!! The two of us managed to consume them within about 3 days…it makes me laugh in your book where you say “this pie is so rich a thin sliver will do” Dream on woman, these things are way too good for a sliver! Pear Frangipane, Key Lime Pie, Rad Whip, Boston Cream Pie and Lemon Mousse pie you’re batting 5 for 5, you’re better than the Babe! I just made this and it lasted about 10 seconds. Everyone loved it! The only thing I found was that I had to cook it about 10 minutes more. Thank you sooooooooo much! Delicious! I made this in 4-inch tarts for a friend’s baby shower yesterday. Everyone loved them! mystery I figured I’d add my experience. I wonder if my very ripe pears caused extra liquid too? They were suddenlyore ripe than I’d thought. Either way it was a hit and I’m making it again! I subtracted the pears, added about a 1/3 of a cup of flour, pre-baked the pie crust, added a layer of strawberry jam under the frangipane, baked it for 40-50 minutes at 350, and as it cooled smeared the top with more jam, and sprinkled on a handful of almond slivers. Delicious!! Mine is in the oven now, been about 40 minutes and still pretty liquidy. I used almond meal from Trader Joes. Only used 2 pears as there was no room for more ant quite figure it why. Big pears? I’m wondering if the still hot crust changed the way it thickens? I didn’t cool the crust very long before adding the filling and pears. I just made this, can’t wait to try it! Has anyone found a fix for the tart being uncooked in the middle? I’ve made several recipes from this book and the cookie book and this is the only one I am having issues with! I follow the directions exactly, yet my batter doesn’t cook in the middle. I’m nervous to leave it in for longer than an hour. Love this – especially the crust, which I made exactly according to the recipe. I can’t wait until fall to make it with pears, so I used two cups of blueberries. I also made some other substitutions: 5 T coconut oil + 2 T lemon juice for the margarine, 1 T kuzu for the cornstarch, and I used a combination of almonds, cashews, and pinenuts in the filling. I baked it for 45 minutes, then cooled it for an hour and chilled it overnight. It came out great! My husband, who loved the Blueberry yogurt pie I used to make said, “you should make it like this all the time!” Now I’m counting the days until October when pears will reappear! I made this when first posted with pears and loved it and just wanted to return and say I recently made it with fresh apricots and it was just as fabulous 🙂 Thanks for the super recipe! I am a new vegan (one year plus)and a huge fan of yours. I have many cookbooks and love the low fat direction you have been heading in. I tried this and found it a tad dry so when my husband came home with a bushel of plums I skipped the crust and subbed silken tofu for the almond milk and plums for pears- it worked really well. Keep up the great work, again I am a big big fan and really love your ideas. This frangipane is so dang good that I ate it by the spoonful. I ran out of pears and did it with apples in a pie crust. Awesome. I had a lot of fun making this since it is so different from anything I’ve ever made before. Unfortunately, this dessert just wasn’t for me. I felt like it was way too sweet, but that is just a matter of taste and I realize now that this is just what kind of dessert it is. Different strokes for different folks. I made the press-in almond crust for this, and unforatunately the edges burned before the frangipane finished setting in the oven. My oven does cook things rather quickly though. I also felt like the crust recipe didn’t make enough crust for the filling (the crust edge ended up being barely visible beyond the filling). I would suggest making or purchasing a regular pie crust for this one (I think it would taste better as well). That being said, I am definitely happy I tried this and I think it is a great recipe to make for a holiday celebration if you do a trial run beforehand. I opted to use the Almond Crust recipe as it used less almonds. Instead of almond milk, I had some canned coconut milk opened and used that. I didn’t par-bake the crust. This tasted like it was full of butter with no butter in it. Had company for supper and served this. It was a gray hit. That was to say, IT was a great hit. I made a fresh apricot tart. I used coconut milk and didn’t put the almond extract. For the jelly I used a peach and apricot jam. Yummy!!!.. PS, To get it to cook thoroughly; make sure your oven temp is accurate. If you’re using a 9″-10″ pie pan instead of a 10″ tart pan, it will need to bake for an extra 15-30 minutes! Tart pans are much less deep. Some people like the filling softer, some like it firmer. Everyone likes it warm. This was easily the best Thanksgiving pie I have ever made! All my guests loved it and they couldn’t believe it was vegan. Thanks so much for the recipe! This was delicious! I subbed persimmons for the pears and used the shortbread crust from the book. At 40 minutes, mine was still looking loose in the center so I cooked it for another 15-20 minutes. I let it cool for a bit then threw it in the freezer for 20 minutes to make sure it set since I made it between Thanksgiving dinner and dessert and didn’t have too much time. Didn’t have any issues with runny-ness like some of the other commenters… perfect consistency. Also…. I like to grind my almonds in the coffee grinder… it’s quick and makes a super-fine flour. This is an amazingly delicious and beautiful holiday desert. Perfect in every way. Very nice desert and so easy to make it!